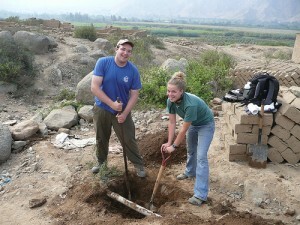 In addition to the two projects in Uganda, EWB sent senior Lee Pearson and sophomore Maggie Hoff to Peru to work with Lindsay Dubbs from UNC’s EWB chapter on a water project in Peru in Summer 2007. Ciudad de Dios is a squatter village, and due to geographical circumstances, only half of the village consistently gets running water. Also, they wanted to bring government teachers to their elementary school. However, they needed to provide running water to the school before the teachers could come, and that’s where Engineers Without Borders comes in. While the Peru team was there, they conducted a site assessment, using a GPS plotter to make a map of the pipes and taps in the village, installing a flow meter at the main pipeline, and choosing a site for a water reservoir at the top of the village. Also, the team was able to address some of the existing water problems. The new flow meter also serves as a cutoff valve, so that leak repairs can be made throughout the village. They helped establish a village water committee that could draft official documents to the villages upstream concerning their water use. “The water committee was really important, because it was a way to give people in the village a voice that didn’t otherwise have,” said Maggie. The team gave the water committee a toolbox that enabled them to fix leaks in the village. Taking a break from engineering work, Maggie and Lindsey led water conservation activities at the school and had kids draw pictures about what conservation means to them. During the current school year, Duke EWB plans to collaborate with EWB-UNC to prepare for the implementation phase this upcoming summer.